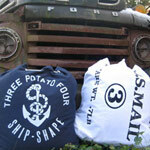 Three Potato Four's brick-and-mortar shop is housed in an old wool mill. If this cage-covered clock gives you flashbacks to dodgeball and the President's Physical Fitness Tests, that's the point. It's based on a model salvaged from an old school gymnasium by husband and wife duo Janet Morales and Stu Eli, who run Three Potato Four. It's also the first piece from a line of reproductions the Philly-based online vintage shop has made for Urban Outfitters. For the real deal, Three Potato Four's site stocks all sorts of masculine, weathered goods for guys who appreciate unique pieces of industrial design, Americana and old school haberdashery. 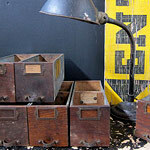 And what's more, most of the American-made antiques (and handsome recreations) are down right affordable. It's all the joy of scoring on Etsy or eBay without the guessing or waiting.